Photograph depicts the construction progress of the Preventive Medical Building (the Wesbrook Building) at the University of British Columbia. Front shot of three story concrete building; facade will be almost entirely windows (currently boarded up); crane tower visible to left of building; extensive construction supplies and debris around perimeter of site; both sides of building are clearly visible; stonework around side steps leading up to entrance of building. Black and white label in bottom right corner reads "U.B.C. PREVENTIVE MEDICAL BLDG. SHARP THOMPSON BERWICK PRATT ARCHITECTS - VANCOUVER B.C. 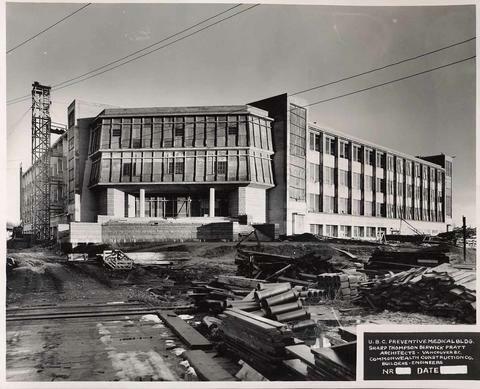 COMMONWEALTH CONSTRUCTION CO. BUILDERS - ENGINEERS NR ____ DATE ____"